Alicia Cook is a Licensed Practical Nurse (LPN), as well as a Master of Traditional Medicines who works in the Akwesasne Cultural Restoration Program (ACRP) also known as Ase Tsi Tewaton (“to make new again”) of the Saint Regis Mohawk Tribe, New York. In her practice, she integrates knowledge of the human body, herbal support, and traditional Mohawk teachings in order to assist her clients in a holistic healing process. Ms. Cook also teaches about culturally important plants and their uses as food and medicine. 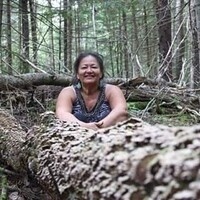 She promotes food sovereignty and aims to transfer traditional plant knowledge to younger generations in order to “carry forward the knowledge of our traditional wisdom keepers.” She is also an activist who cultivates plants on the United Plant Savers list, as well as working towards decontamination of land in the Mohawk territory. Ms. Cook is also focused on reviving teachings and ceremonies that strengthen women in her community. She also travels nationally and internationally to teach about natural medicines and encourage the reintegration of traditional plant knowledge that was lost during the colonial era. Her talk will begin with a recitation of the Haudenosaunee Thanksgiving address (words before all else) and a discussion of its importance and relevance to gratitude for all natural relations. She will also discuss the concept of reciprocity and its relationship to plant knowledge, before introducing local herbs that are safe and useful, and finally inviting attendees to sample herbal teas.